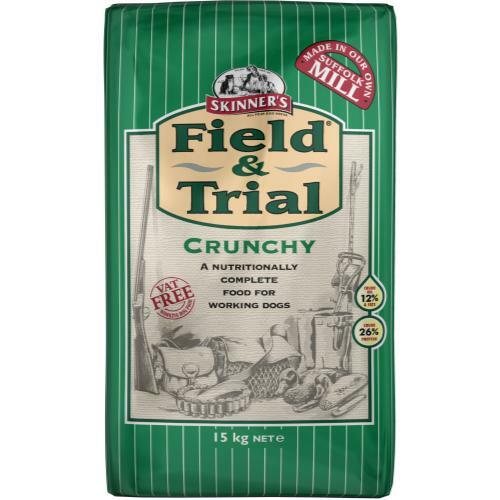 Skinner’s Field & Trial Crunchy is a delicious complete dog food formulated to cater to the high energy demands of extra hard working dogs. Also suitable for the specific requirements of puppies aged between 8 and 18 months old, Field & Trial Crunchy contains chicken oil for an extra burst of energy as well as rice and cereals for slow burning energy that lasts all day. As a working dog food, Field & Trial is VAT free, making it the ideal way of providing you hard working canine with their complete daily nutritional requirements. Nutritional additives per kg: Vitamin A 17,600 iu, Vitamin D3 2,000 iu, Vitamin E (as alpha-tocopherol acetate) 200 iu. Trace Elements per kg: Iron (as ferrous sulphate monohydrate) 10mg, Iodine (as calcium iodate anhydrous) 1.5mg, Copper (as cupric sulphate pentahydrate) 7mg, Manganese (as manganous oxide) 50mg, Zinc (as zinc oxide) 90mg, Selenium (as sodium selenite) 0.1mg. Field & Trial Crunchy contains easily digestible chicken needed for strong muscles, teeth and bones. Specially formulated to meet the needs of all breeds of working dogs with moderate to high energy requirements.